The stats tell me there are a bunch of Johnny-come-lately's checking out this space on a daily basis. There are a few things you newbies are likely unaware of, so here's a list of things you might not know. This site has a sitemap. From there you can see the pages that didn't make the main navigation menu up top. There's a link to the sitemap on the bottom of every single page. There's an RSS feed just for comments left on this blog. Sometimes the best stuff gets lost in the comments. I often forget to update my pictures page. The best way to see my latest photos is to visit my Flickr page. If you're new to these parts and you want to catch up on what you've missed, a great place to start is the archives page. From there you can jump to any month or category. I go heavy on the Leafs, Jays, Simpsons, Hip and I love lists. You see, it's all about me, I'm just letting you peek in on the action. And now, in a completely unrelated vein, here are a couple of bills I'm hanging on to so I can impress the kids when they're older. HAving used to come up to Canada to Long Beach when I was younger with my parents and Aunt, Uncle and so forth to spend the last few weeks of summer, I used to get Canadian money from my dad to spend while we were up there. 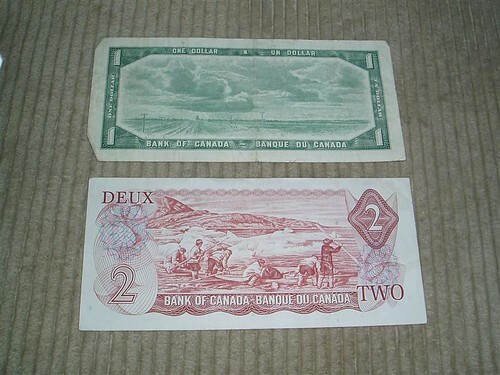 I loved Canadian money, so much more colorful than the US Green....Well, I kept one of each of the denominations and I have a few canadian $2 bills left from those days. Never got rid of them. I love the $2 coin its a great coin but there was something cool about a Canadian $2 bill to me. maybe im just being wierd...Anyway your $2 bill reminded me of Long Beach of all things. Hey Mike, I have 1954 series from $1 to $100 just because that's the year I was born. Mike(Buffalo Boy) I have a U.S. $2 bill and a Susan B. Anthony coin. I think it's a dollar. Should I change my usual handle to Ajax Mike?